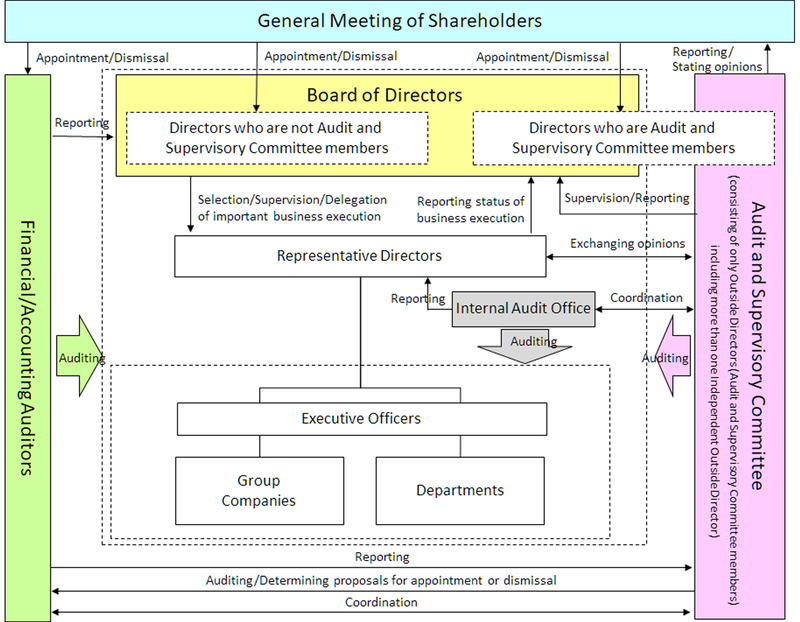 Corporate Governance | Coca-Cola Bottlers Japan Holdings. Our basic policy for corporate governance is to increase the efficiency and transparency of business management, thus raising our corporate value. To strengthen corporate governance systems, we have adopted an Audit and Supervisory Committee system. The Audit and Supervisory Committee, which monitors and audits our business, consists only of outside directors, including more than one independent director. These outside directors serving on the Committee have the rights to vote for the Board of Directors and to make a statement about nomination of directors, remuneration, etc. for the General Meeting of Shareholders, which further enhances the effectiveness of the supervision of business management. We have also adopted an Executive Officer system to separate the decision-making and supervisory functions of the Board of Directors from its business execution. By delegating part of decision-making authorities for material business execution to directors, we ensure that matters of special importance are discussed thoroughly by the Board of Directors, while other business judgements are made swiftly by executive officers under Representative Directors (the executives). Coca-Cola Bottlers Japan Holdings (CCBJH) expects all of its employees to comply with the law and act ethically in all matters. We also expect our business partners (the Suppliers) who provide goods and services to CCBJH to act in the same way. Only through the integrity the many people who are relevant to our products will we be able to deliver our refreshing image with consistency. Both by ensuring superior quality for the goods and services we procure, and also by ensuring that our Suppliers comply with the law and act ethically, we will be able to form a sustainable society together, and therefore fulfill our social responsibilities. Therefore, CCBJH has developed the “Basic Policy for Suppliers,” and expects the Suppliers to comply with them. We appreciate the compliance of in this matter and with the Basic Policy for Suppliers.